← >Hey, I’m starting an official foodblog!!! >I scream for Ice Cream more than anyone else or at least more than is good for me. So in honor of all the ice cream support group members I bring you the following discussion and recipe for Halvah Ice Cream. Halvah is a middle eastern/jewish food. It’s basically tahini (a paste of crushed roasted sesame seeds the consistency of liquidy peanut butter) plus lots of sugar. So my decision was between making a smooth tahini based ice cream with the tahini entirely incorporated into the cream. 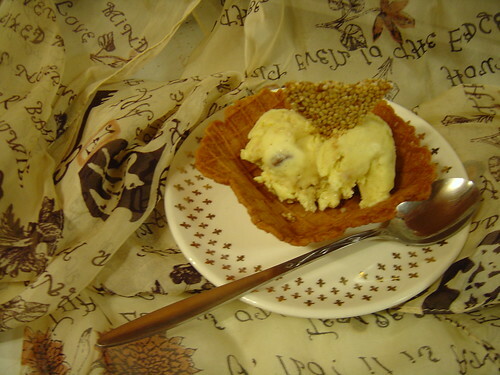 Or making a vanilla base ice cream and mix in chunks of tahini, a la cookie dough ice cream. I opted for the later. So I made the vanilla base (using goat milk because I was curious), added a tablespoon of tahini for shits and giggles. Made the custard. Decided it needed a kick and mixed in about a half cup of thick middle eastern yogurt (called Labna) and some sesame oil. After the base chilled I ran it in the machine and mixed in 2 cups of chopped halvah and after it was done I mixed in some wet pistachios (based on David Leibovitz’s Wet Walnuts recipe). I’m totally pleased with the result, it’s an interesting taste without being too crazy (unline Leibovitz’s basil ice cream), the halvah added an amazing texture when frozen. Technically this was a reduced fat ice cream (though not by much). 1) Put milk, half-n-half, sugar, salt, vanilla bean in a medium pot. Heat just to a simmer but DO NOT allow it to actually come to a simmer. Stir frequently to avoid burning. 2) While dairy is heating separate the eggs and whisk the yolks until they lighten. 3) When dairy has heated remove from the stove and allow it to sit at room temperature for 30min. Using about 1/2 cup at a time SLOWLY stream the dairy into the eggs while you WHISK LIKE A MOTHERF****R. If you don’t whisk like a Motherf****r your eggs will curdle and be nasty. I recommend two people to do this job (thanks beatnik). 4) After you have mixed in about two cups of the hot mixture whisk the egg mixture back into the hot cream (streaming SLOWLY). 5) Heat the mixture up again over medium heat, stirring all the while. As soon as the mixture thickens to coat your spoon remove it from the heat. DO NOT OVERHEAT OR YOUR EGGS WILL CURDLE. 6) In your mixing bowl add the 1/2 cup yogurt. Using your fine mesh sieve strain about 1/2 cup of the heated custard base into the mixing bowl and whisk the custard and the yogurt. Repeat two more times. Then strain all of the remaining mixture into the mixing bowl. 7) Immediately place your mixing bowl into the ice bath (to avoid overcooking the yolks) and whisk all the liquid together. Scrape the seeds from your vanilla bean and add to the mixture. Add the 3/4 tsp of vanilla extract. 8) Stir for a few minutes and allow to cool in the ice bath. Then pour your vanilla base into a tupperware and allow to chill for at least 4hrs in your fridge. 1) Heat the liquid sweetner and salt in a small saucepan stirring constantly to avoid burning. Just when it comes to a boil add the pistachios and stir for 10 seconds more. Remove from heat and allow to cool to room temperature. 1) Chop the 2 cups halvah into smallish size chunks. 2) Run the vanilla-sesame base according to your ice cream machine’s directions. About 5 min from the end add the halvah. Mine wouldn’t all fit into the machine so when it was done I ended up dumping it all into my big tupperware and mixing it by hand. At the very end add the wet pistachios BUT STIR AS LITTLE AS POSSIBLE. That’s a lot of directions for one little ice cream batch. But the truth about ice cream is that it’s not hard so long as you do it in the right order, avoid doing things that will mess it up, move quickly, and most importantly….. WHISK LIKE A MOTHERF****R.
Hopefully I’ll have a picture to post with this sometime. Posted on November 13, 2007, in ice cream. Bookmark the permalink. 3 Comments. >You, ma'am, are my hero.That earl grey ice cream you brought to breakfast after the October bout was amazing. >This was an excellent batch! Too bad your cow-orkers got the lion's share of it. Will it come again…? >Once I had a chance to have Swiss premium ice creams and an array of coffee & desserts . Me and my colleagues had two scoops of Movenpick ice creams of our choice. They were simply soothing. This is something one can’t afford to miss.You scream, I scream for Ice Cream! !